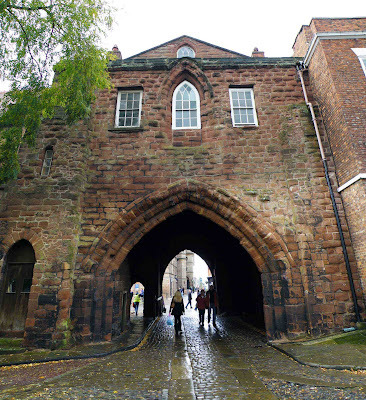 The imposing gatehouse at Chester Cathedral is a stunning building situated on Northgate and facing directly down Princess Street. The gatehouse is Grade I listed, and probably dates from the 1300's, when it was the secure entrance into the precincts of St Werbergh's Abbey. 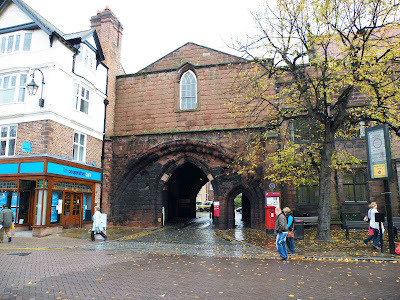 The photo below shows the main vehicular archway, with the smaller pedestrian archway to the right hand side. On each side of the entrance on the external wall, are two blind niches, possibly originally containing statues of saints. The upper part of the building dates from around 1800, and is accessible via staircases to the left and right of the road through the gatehouse. The photo above, shows the gatehouse from within the precincts of the abbey grounds. There is no pedestrian archway at this side of the gatehouse....only a larger archway through which all traffic passed. The small arched doorway to the left of the arch houses a stairway that leads to the upper floors of the gatehouse.